It is worthy of sharing to keep enlightening the reasoning of our people as to why elections in Biafra land must be boycotted. 1. 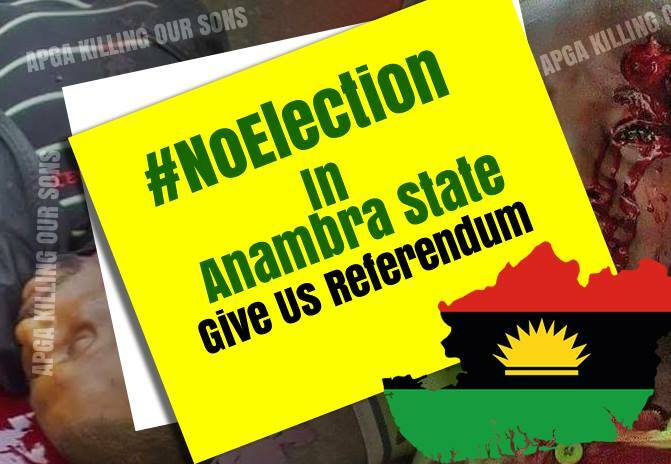 Why must it be Anambra in all things that concerns Biafra. 2. The Elites are not in support of Biafra Restoration. 3. The majority of the people calling for election boycott in Anambara are not Anambrarians, among many other minor reasons which I trashed out to his primary understanding. Then I answered him chronologically inline to how he outlined his reasons thus. History have made us to understand that Anambra is the father of the Igbo nation that is, it was from Anambra that all other Igbos emerged, being the land our progenitors occupied on their arrival to the hinterland of the River Niger. By right and ordinance, they are the first son of all Igbo tribes and no one can contend that. Also, as the first son of Biafra, she have been saddled with the responsibility to shoulder all other tribes in Biafra land as such, God the Creator of Heaven and earth in His unmatchable wisdom have known that a day like 18th of November 2017, will come when he singled out the Anambra state gubernatorial election from other states of the Nigerian Federation just to honor that position of 'firstsonship'. Above all, having exercised all peaceful means of freedom fighting known to humanity, the only option left is Civil Disobedience which coincidentally or divinely oriented, Anambra election presented itself as the first all important election in Biafra land since after Nnamdi Kanu the leader of the Indigenous People of Biafra (IPOB) which happens to be the umbrella body that is championing the restoration of Biafra nation, was granted bail. More so, on his fear that the Federal government will use the boycotting of Anambra elections campaigned by IPOB to sanction Anambra state which will eventually trigger the suffering of all that resides in the state if allowed to become a success, I made him to understand that if truly the government will score any credit as regards to the boycotting of the election which as he insinuated will make Anambra people to suffer, looking at how dicey IPOB have made the Nigeria State to be and the massive support IPOB gains from Anambra, they would have kept quiet so that the people can 'stupidly' have a successful boycotting of the election for them to use it as an excuse to deal with Igbos and quench Biafra spirit forever but because they have seen that they have lost the game on arrival, that is why they have applied brute force to quench the evangelising spirit of the boycott knowing that it's success will spell a big doom to them. Would you allow someone to take away your glass of wine from your hand knowing that if he does that you will not be able to recover it back whereas you know that you are still in need of the glass for your subsequent drinks? He emphatically thundered 'No' in response. Then I told him that how would you expect the so-called elites to support the restoration of Biafra nation and abandon their source of income wherefore they know that in the new nation, they will not be recognized taking into account the atrocities they have committed against their own people just to enrich their personal pockets. Besides, who made them 'Elites' over the people? As he grimaced at me, I made him to understand that even the so-called Rich men are not and will not be happy or be in support for Biafra restoration because Nigeria operates on a monopolistic kind of service or market for which when one climbs, he would not allow any other to come up which they vividly know that it will never be feasible in the new nation Biafra because Biafra will never encourage the syndrome of 'The Rich get richer and the Poor dies poorer', therefore because they know this, they resorted to complaining about what will be of their investments outside Biafra territory just to score cheap sympathy from the populace as if the universal law of properties protection outside one's country of origin will be abrogated just because Biafrans are seeking for their independence. Hypocrisy indeed! I quickly drew his attention to what Igbos use to say; (Onye ji ejo kwaa nna, Na obughi Okpara gburu Nna) which translates to 'he who is buoyant enough can take the burial responsibilities of his father because it is not the first son that killed their father'. But on a more realistic note, I asked him the yardstick which he used to draw to his conclusion because so long as the agitation to restore Biafra's sovereignty is concerned, Anambrarians have been championing the cause and for the many reasons that he have not keyed in fully doesn't mean that Anambrarians are against the restoration of Biafra through the ordered elections boycott. In a conclusive note, having concurred to our interactions, I made him to understand that what a man does or is determined to do lies within inside his heart not just on what is said but we believe that come 18th November 2017, Anambra people will obey the Will of God and at the end, Biafra Sovereignty will be restored and the people of God will praise him in an unusual way.